Haworth cubicles provide the adaptability companies need to accommodate changes in the workplace while also providing a harmonious balance of durability and beauty. Panel Systems Unlimited specializes in gently used systems furnitureand offers a wide selection of affordable, used Haworth cubicles for offices nationwide. What separates our used cubicles from those sold by many other wholesale office furniture companies is the exceptional quality and appearance of our offerings. We don’t accept any used cubicles into our inventory unless they pass our strict quality standards. The cubicles we select are then cleaned and retouched by the skilled hands of office furniture professionals with more than 40 years of combined experience until they look like new. When you buy cubicles from Panel Systems Unlimited, you also receive the benefits of professional space planning services. Our design and installation team will create a detailed CAD drawing of your office and configure your furnishings to help improve workplace efficiency. 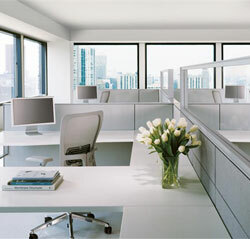 We also take care of all of every aspect of installation from workstation assembly to electrical hookup. Our team can even handle liquidating your old office furniture. Contact Panel Systems Unlimited today for more information on our selection of used Haworth cubicles, computer workstations, and other exceptional office furniture.